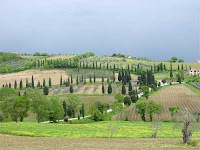 Tuscany teases, tempts and tantalizes. There is a sensual quality to everything from the superb food to the fine art that one encounters wherever one goes. The Tuscans themselves are a joyful people, fiercely proud of their glorious place in the sun. Eugene and I have been completely seduced by the sheer lusciousness and beauty of everything. Explore this lovely area with Back Chat and experience a large dose of La Dolce Vita. If you would like to know any more, do contact me at Back Chat or email me at les@leslieback.co.za . Ciao for now. We were in Tuscany! Tuscany that tempts, teases and tantalizes and where the language of Dante, Machiavelli and Boccaccio is still alive. Back Chat reminisces. We had driven to this glorious region of Central Italy from Cannes in the South of France. The Villa San Paolo, situated just a few kilometres outside the ancient walled city of San Gimignano, was a splendid sight. Surrounded by olive trees, the Tuscan hills and beautiful Italian gardens, we immediately fell in love with the mix of ancient villa and modern hotel that was to be home for some days. Midsummer in Central Italy can be stiflingly hot and overcrowded, so this visit was planned for late April. Numerous maps and details of places to visit were provided by the padrone, but first, a stroll around the gardens of the villa. The vegetation was lush, sometimes wild, sometimes organised, with seating areas for peaceful moments. Then the pool! I felt as if we had strayed into the world of Scott Fitzgerald. At any moment Jay Gatsby would come sauntering along dressed in impeccable white, probably sipping champagne and accompanied by an entourage of equally elegant friends. Surrounding the pool were white-curtained cabanas. The curtains were drawn back and the whole effect contributed to the sensation of belonging to that era of wild indulgence. Marvellous! 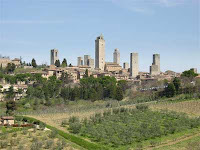 Now the exciting prospect of a visit to San Gimignano, the small, walled medieval hill town that was visible from the hotel and a short drive from the Villa San Paolo. Happily we barrelled through the beautiful countryside. We parked in a car park just outside the walls and walked into the village. Thankfully, the tourists had not yet descended and it was easy to get about. Tall, fortress- like towers dominate the landscape and remain as symbols of bygone battles between medieval nobility. Thirteen towers remain, rather remarkable given all the wars and catastrophes that beset the village. Beautiful piazzas are the heart of the town. There are tavernas, always with Italian men sunning themselves and drinking tiny espressos or pre-lunch apperitivos. I have often wondered if these men ever work. Italian men are great appreciators of the female form of any shape, size or age. Enthusiastic whistling and shouts of ‘bella’ made happy, background sounds. Eugene eventually stopped bristling and relaxed into the atmosphere of amiable banter and fun. Sitting at one of the tavernas and enjoying a granita, I was struck by a feeling of familiarity. How could that be? I later discovered that parts of the film, ‘Tea with Mussolini’, were shot in San Gimignano. Judi Dench, Maggie Smith, Joan Plowright and Cher played expatriate English and American women in Italy during World War 2. The women saved frescoes from Nazi plunder. These frescoes are to be seen in the Duomo, the town’s main church. 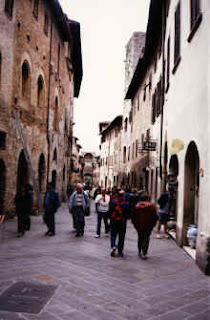 There was much to see in spite of the fact that San Gimignano is tiny and one can walk from one end of the village to the other in fifteen minutes. Wonderful frescoes adorn the museums and chapels. The arches and the towers in the piazzas are especially beautiful. Closer inspection would yield many more treasures. The delicatessen shops were a treasure trove of luscious foods. I was completely thrown by the sight of stuffed wild boar at the entrances of these establishments. Previously I had seen dishes involving wild boar advertised on menus but I had never imagined that the poor benighted creature would be standing in the doorway of places that sold all its bits and pieces. Back to the villa to rest and to plan the next foray, this would certainly be to eat. Somehow we always seem to identify gastronomically with the countries we visit. And this was to be no exception. Our genial host recommended a restaurant, Antica Trattoria, situated nearby between the Villa and the village of San Gimignano. The idea of eating rustic, home-style cooking was particularly appealing. And we were starving. There would certainly be no language problem as Italians happily speak a sort of sing-song English, so unlike their French counterparts that make one go through all sorts of linguistic contortions to make oneself understood. 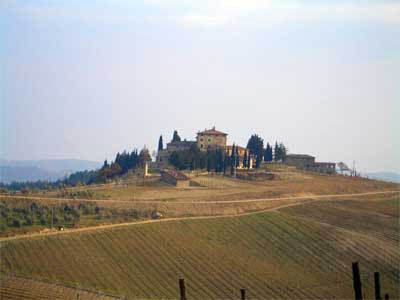 The most important ingredient of Tuscan food is olive oil, exquisite olive oil, usually grown and pressed in the area. First we shared an antipasti of Prosciutto served with sweet melon and figs. Succulent and delicious. I enjoyed a light- as- air eggplant ravioli while Eugene made short work of a hearty zuppa di Faglio, a bean soup. We followed all this with a tomato salad, Insalata Pomodori, all the while sipping crisp Chianti. Our waiter’s face fell when we declared that we could not eat another thing. He rattled off a long list of delicious options, but to no avail. He brightened up when we said we would come again soon and pressed us to have a small coffee served with homemade almond biscuits. Ideally, one would eat another course, possibly fish or meat and then a dessert. In future, we would eat the first courses with less gusto and leave space for all the delicious things to come. The next morning, rested and refreshed, and armed with copious maps and instructions, we set out for Florence. It seemed miraculous that Florence, this place of dreams, was less than an hour’s drive away. In the course of our sorties by car during the next few days we were to become familiar with a town called ‘Poggibonsi.’ It seemed all roads lead to Poggibonsi. All our destinations seemed to require passing through Poggibonsi. This day was no exception and then north to Firenze. We had been to Florence many times previously, but never by car. It is well known that driving in Florence requires the same degree of craziness the Italians display in their rather manic approach to most things. One way streets, hooting and honking at every possible opportunity, mad gesticulation and ultimately no parking in the centre of Florence except for residents. We planned our strategy. We would park our car in the free parking area on the Piazzale Michelangelo, enjoy the breathtaking view of Florence and then take a bus down to the centre. We duly arrived at Michelangelo’s Square and parked the car. The view is magnificent and requires time to stand and stare. There is a magnificent view of Brunelleschi’s dome atop the Cathedral Santa Maria del Fiore. This technical and architectural wonder dominates one’s visual landscape. Then the bus and there lay the rub. We found the bus queue and noticed that everyone seemed to be clutching their tickets. We were told that you could not board the bus without tickets and would have to acquire them at a wooden booth nearby. The booth was shut tight and would remain so until 2pm. It was lunchtime!! So the situation was that we could not buy a ticket and we could not get on the bus without one. All attempts on our part to get any information were met with much shrugging and gesticulation. The situation was further complicated by the fact that there were no taxis. Eventually a taxi did arrive and we leapt in before anybody else could get to it. We sailed into the centre of Florence, happy to have survived the experience with blood pressure and sanity intact. As it was lunchtime we sought out a favourite restaurant, The Ristorante Buca Mario on the Piazza Ottaviani. From the street it looks pretty unprepossessing, but when one enters the large underground warren of rooms, with white walls and red and white checked table cloths, it is immediately warm and welcoming. The restaurant has been in existence since 1886. It is unapologetically touristy, but the food, the service and the ambience are superb. We ordered a pitcher of dry white house wine. Delicious and crisp. Italian restaurateurs are as proud of their house wines as are their French counterparts. To start, we shared a delicious antipasti of zucchini and artichokes. Eugene could not resist the Florentine speciality, Bistecca alla Florentina, a thick T-bone steak grilled over charcoal and served rare. I enjoyed a Pollo Diavolo, flattened chicken breast marinated in herbs, garlic and olive oil. Lunch over, it was time to revisit some precious Florentine memories. We crossed the River Arno via the Ponte Vecchio, this bridge where one is greeted by the sight of beautiful stores and the sound of hawkers peddling their wares. Fabled goldsmiths market their wares here. The art of the goldsmith has long been revered by the people of Florence and artists such as Ghiberti, Donatello and Cellini practised the art. It is always a prize to acquire a piece of this exquisitely crafted jewellery. Once across the bridge we wandered along the bank of the Arno to the Pension Hermitage, a delightful hostelry where we had stayed on many previous trips to Florence. As with many things Italian, there is an element of eccentricity about it. Here the manager/owners, brothers, knew us well, but invariably messed up the bookings. We would arrive, tired and travel worn; to be told there were no rooms. Impossible! The excuse, ‘my brother, he make- a- da booking.’ Always the other brother’s fault, much eye-rolling and melodramatic sighing, yet somehow a room would always miraculously become available. The pension is cheek by jowl with other buildings and a window in our room opened up an arm’s length away from a window in the next building. A tailor sat at the window busily sewing away. The result was that I had to dress with the curtains drawn except on Sunday. The Pension is still flourishing, a wonderful place to stay and only a moment away from all the sights of the city centre. But, most of all, an untrammelled view of the Arno. Literally, just around the corner from the pension is the Uffizi Gallery. Sadly, we had not booked tickets in advance and the long queue outside was not moving. This interlude in Florence would be a time to but briefly and gently touch long held memories. Favourite treasures in the Uffizi would remain as promises for another time. But we had reserved tickets to see Michelangelo’s David at the Accademia delle Belle Arti. I am always overcome by the wondrous beauty of this sculpture and the defiant youth who seems to celebrate his freedom from an imperfect block of marble. One of the Master’s last works, the Pieta, is in the Museo dell’Opera del Duomo. In the space of one short day one can visit a sculpture completed when he was 29 years old and another when he was nearly 80 and contemplating his death. Only in Florence!!! Never forget to rub the nose of ‘il Porcellino’. It is said that doing so means that you will return to Florence. 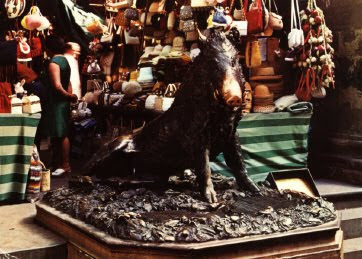 It is a bronze statue of a wild boar whose nose glistens from centuries of being rubbed. Everybody must long to come back to Florence. Far too soon it was time to start back to the Villa. We hailed a taxi and returned to the Piazzale Michelangelo. Just time to stand and stare again at the Florentine skyline and to sigh at the beauty of it all. Now south to Poggibonsi, and then west, back to our lovely corner of Tuscany. Another outing was to Siena, a small medieval city about 40 kilometres from San Gimignano. After much consultation with the padrone and careful map-reading we set out. East to Poggibonsi, always Poggibonsi, and then south to Siena. The first sight of Siena is quite breathtaking. Surrounded by olive groves and the vineyards of Chianti, it is set on 3 red clay hills from which the colour ‘burnt sienna’ gets its name. It really is the same colour one always had in one’s paint box. Parking in Siena can be a problem. There is free parking outside the city walls, and then a trudge up the first of many hills. Comfy shoes are an absolute must. In just a few short hours one can hardly do justice to all the sights and sounds of Siena. We were determined to see the famous Campo, surely the loveliest of all Italian public squares. It is a great scallop –shaped piazza from where the whole of Siena seems to radiate. Over four hundred years ago, Montaigne described it as one of the most beautiful squares in the world. One of the most fascinating aspects of Il Campo is the Palio, a horse race and Siena’s biggest tourist attraction that takes place there twice a year. The 2nd of July and the 16th of August are the dates of this spectacle and what a crazy and cruel spectacle it must be! The horses charge around the square, often crashing into the stone walls. Mattresses are placed against the walls, but do not provide much protection. People watch from the centre. Apparently it is the only race in the world that a horse can win without a jockey! The tradition of this ancient sport is jealously defended by the locals and one is left to wonder that people can be so blind to its cruelty. Campo means field, which it originally was before being transformed into the paved square it is today. It was a market place, the scene of public executions and bullfights and of course the Palio. I cannot imagine that the Palio was ever meant to be anything more than a horse race around a field! Never, never around a paved Piazza. The great Gothic Palazzo Publico (city hall) dominates the square. There is a watch tower, the Torre del Mangio, which seems to stand and glower at everybody. Lots and lots of history in that square and I am convinced, lots and lots of ghosts. At the highest point of the Campo is the famous Renaissance Fontana Gaia (‘Gay Fountain’). This is a pool surrounded by famous 14th and 15th century carvings, which sadly today are only reproductions. The originals are in the Loggia of the Palazzo Publico. Time for lunch and an opportunity to sample some Sienese food. Sienese food is simple and pure, marked by the excellence of its ingredients. 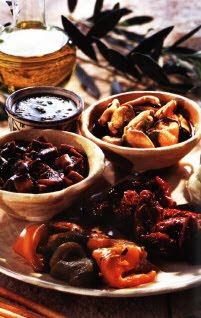 Beautiful meats, vegetables and herbs and of course the use of superb olive oil in most of its recipes. Eugene ordered a plate of Fagioli all’Ucceletto. This is a bean dish flavoured with olive oil, garlic, tomatoes and sage. I have always loved bruschetta, an appetizer made of roasted Tuscan bread with tomatoes, fresh basil and olive oil. Another delicious starter is Crostini di fegato. This is a platter of lightly toasted slices of bread spread with a liver paste of chicken livers, marvellous herbs, capers and anchovy fillets. So we had a feast of all these things with some extra bread to mop up the bean sauce and delicious crisp young Chianti to wash it all down and to complete the enchantment. Italian waiters generally think it is quite mad eating this way, but then we are just crazy turisti. Again the day seemed to slip away. There was enough time to visit the Duomo. This exquisite building is a conglomeration of Romanesque and Gothic styles with fascinating bands of black and white marble on the facade. Black and white are the symbolic colours of Siena. The interior is a marvel of frescoes and sculptures. Oh, the joy on happening upon the carvings of a very young Michelangelo! He was commissioned to sculpt fifteen statues of saints. He completed Peter, Paul, Pius and Gregory and then was lured to Florence where he executed his masterpiece, David. Time to go. Back to the car and a last look at the wonderful colour of the hills of Siena disappearing as we turned north to the inevitable Poggibonsi and west to our beautiful Villa San Paolo. In the short time left to us in Tuscany, we visited Lucca about 60 kilometres from San Gimignano. It is a jewel of a Tuscan town, set inside a ring of Renaissance walls and huge bastions. It is a serene, graceful town where locals ride bicycles and the city centre is refreshingly free of the tumult of traffic. Quiet, but never dull. Now it was time to move on. Our next destination, Montreux, on Lake Geneva in Switzerland, a distance of about 470 kilometres. We would drive along the west coast of Italy and turn inland just beyond Genoa. 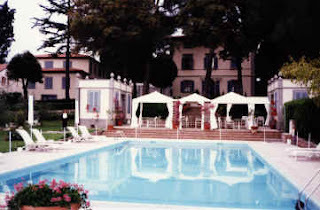 Another great adventure waited... Farewell lovely Villa San Paolo, farewell Tuscany, place of dreams. Ciao Toscana bella.